Jordyn Woods is gushing over her BFF Kylie Jenner! 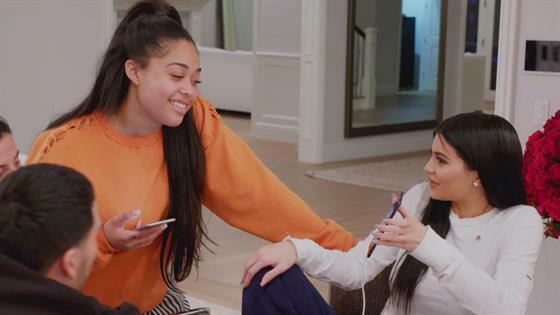 In this preview clip from Sunday's premiere of Life of Kylie, Jordyn opens up about their longstanding friendship. "Kylie and I have been best friends since eighth grade summer going into high school. Kylie is super outgoing," Jordyn says. "We have a special connection where we just get each other. Knowing you could tell them like, 'Hey I just killed someone, I need you to come...' Not saying we'd ever do that." Kylie is such a good friend, she then tries to set Jordyn up on a blind date. "I know somebody who knows somebody that wants to take you on a date. Do you want to know what he looks like?" Kylie asks. "Do not play me right now!" Jordyn tells Kylie. "He's cute!" Kylie replies. So what happens next? Watch the clip to see how Jordyn reacts to Kylie's date!